I don't know about you but i'm not a big fan of plums,i eat them every now and then but most of the time they are forgotten in the fruit bowl. This is strange because all my childhood i spent my summer holidays in the countryside and climbing every tree and eating plums straight from the tree was one of the first thing i was doing when i discovered my grandparents' orchard. Even i don't buy them regularly,when i do and they're ripe, smoothies are the first choice and even so,sometimes i have leftover fruit.And you know leftovers develop great recipes,right? 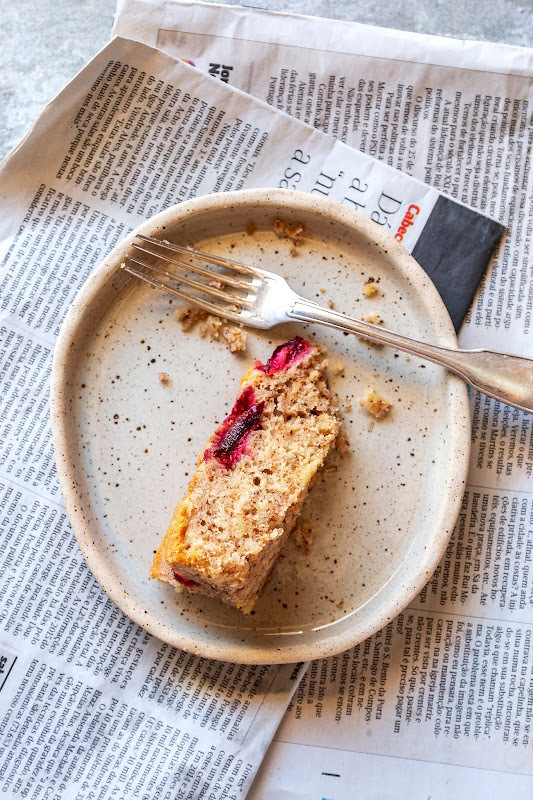 It's moist,fruity with nutty notes and not too sweet.This cake is delicious served for breakfast alongside a cup of coffee or even a cup of tea .Is also great for a dessert ,served with ice cream or crème fraîche! Line the botton and sides of a 23 cm(approx.9-inches)springform pan with parchment paper. Place walnut kernels in a food processor and blend until finely groud.I strongly advise you to use walnuts in shell,store-bought walnut kernels taste rancid and i'm pretty sure you don't want a cake with that unpleasant taste. 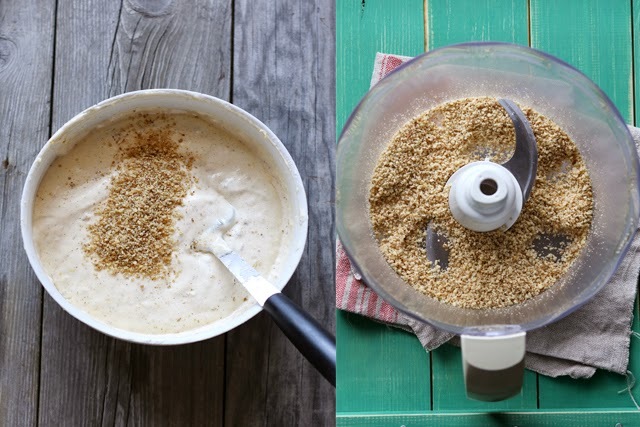 Place butter and sugar into a large bowl.Beat with an electric mixer until creamy. Add the eggs,one at a time beating well after each addition. Sift the flour and baking powder on top of the egg mixture,a little at a time, and fold it gently using a silicone spatula. Add ground walnuts and mix gently to combine. Pour the batter into the prepared pan and spread it evenly with a spatula. Arrange sliced plums on top and bake at 180ºC for 40-45 minutes until golden brown on top the toothpick inserted in the center of the cake comes out clean. Once baked,release the cake from the springform pan and let it cool on a wire rack. Sieve some of the icing sugar on top and serve! 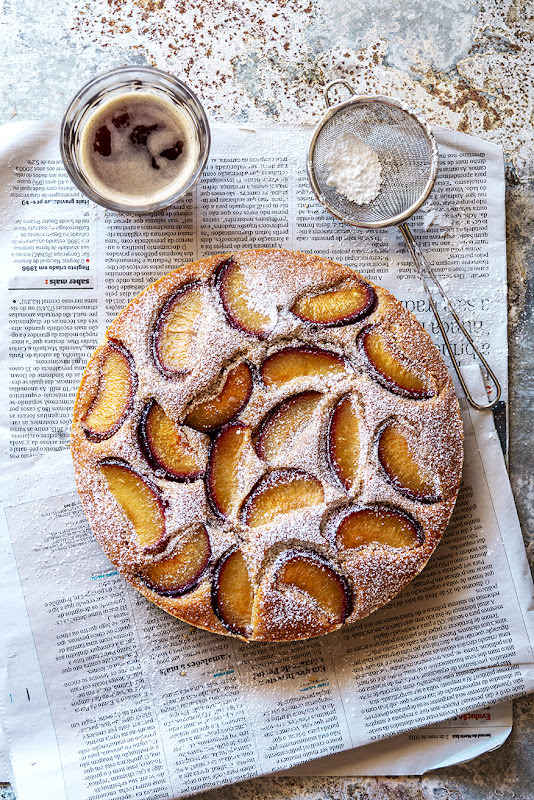 The plum cake looks gorgeous and nice with a cup of tea! Gorgeous photography! This looks like the perfect holiday treat! Preparatul e incantator, iar fotografiile sunt superbe, felicitari!